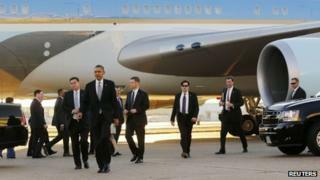 Two US Secret Service agents have been removed from President Barack Obama's security detail amid allegations of sexual harassment and misconduct, US media report. One agent inadvertently left a bullet in a woman's hotel room, then demanded to be let back in, it is reported. Both he and another agent also reportedly sent sexually inappropriate emails to a female colleague. The story was first reported by the Washington Post newspaper. Lawyers for the agents declined to comment to the paper. Secret Service agent Ignacio Zamora Jr - a senior supervisor who oversaw about two dozen agents in the president's security detail - was reportedly off-duty when he met a woman in the bar of the Hay-Adams Hotel near the White House in May and later joined her in her room. According to the Washington Post, Mr Zamora, who previously led former First Lady Laura Bush's protective detail, removed the ammunition from his government-issued weapon while in the hotel room. When he left, he realised he had left behind a single bullet. When he sought to get back in the room to retrieve the bullet, the woman refused to let him in, the Post reported. Mr Zamora then identified himself as a Secret Service agent to hotel security and demanded access to the room. An investigation into the incident found sexually suggestive messages to a female agent on Mr Zamora's government-issued mobile phone. Further investigation uncovered similarly inappropriate messages sent to the same female agent by another supervisor, Timothy Barraclough. The service subsequently removed Mr Zamora from his position and transferred Mr Barraclough to another role. Secret Service officials have declined to comment further on the matter. The row is another blight for the security force, already attempting to rebuild its reputation following a wide-reaching prostitution scandal revealed in April 2012. A number of agents were dismissed following allegations they hired prostitutes while they were in Cartagena, Colombia, preparing the way for Mr Obama's visit to the Summit of Americas. That incident prompted vows from officials to curb the agency's perceived male-dominated hard partying culture. In March, Mr Obama named veteran agent Julia Pierson as the Secret Service's first female director, in an attempt to restore public confidence in the security force's operations.